Our timing for Vegas couldn’t be worse. We happened to be traveling during a record-setting heat wave. The temperatures have been in upper hundred-teens. Yes, that is teens with a 100 in front of it. I’ve been to Vegas in the summer, and it is always going to be scorching, but I don’t remember experiencing anything like this. The only option for riding was to head out at the crack of dawn. Even then, it was 95 degrees when I left. My east coast friends will remind me that this is a dry heat. That might make a difference at lower temperatures, but anything above 110 is flat out painful, dry or otherwise. 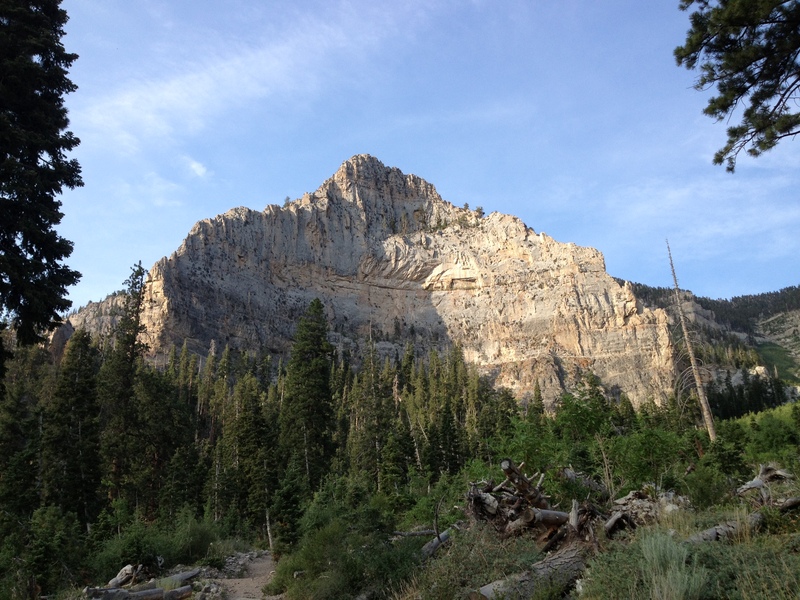 I drove to the beginning of the Mount Charleston climb before the sun was out, and was ready by sunrise. Still reeling from the heat, I was hoping that climbing into elevation would give me some respite. I got myself situated with the rental bike as much as possible, but I didn’t want to waste time. The longer I waited, the hotter it would get. As I began the ride, I had a feeling of unfamiliar discomfort. The Scott Speedster 40 that I rented was a good bit heavier than my bike, had different components/shifters, and was fit differently. It just felt wrong, but was something I could suffer through. The climb begins deceptively. It has the look of a long, flat desolate road in the desert. That is a false flat, as it turns out. The grade was usually only 2-3%, enough to keep myself moving slowly, yet not nearly enough to hurt. I was still climbing. At one point I looked down and was surprised to see I had climbed almost 1,000 feet. At one point, it seemed like the pedaling became more difficult. The road looked the same, but something was noticeably wrong. I felt something on the back tire, at first thinking/hoping/wishing that it was the contours of the road that made it feel off. Then it hit me. I had a flat on the rear tire. It was 4 miles into the ride. You have to be kidding me! As I ruffled through the saddle bag, I could feel the sun on my back and neck. Even at a slightly higher elevation, it was getting hotter. There was no tube. There was a multi-tool, and that was about it. I had a tube in the car, which I had forgotten to bring, not knowing I would need it. I knew right then that this wasn’t going to work. This was a foreign bike, with different types of components, and the flat was on the back wheel. Even if I grabbed the tube from the car, and got it road ready, I would be going up a massive mountain in dangerous temperatures without a safety net. That was the end of the ride for me. It was a tough time even getting back to the car. The valve stem was broken, so despite my best efforts, I couldn’t get air in the tire with the hand pump. I had to alternate coasting with walking. It took me almost as much time to get down those four miles as it did getting up. If there’s one thing I hate, it’s missing exercise. Rather than ruin the morning, I drove the 18 miles to where the road ends. The temperature dropped to a cool 70 degrees, and the views were spectacular. Since I still had a few calories to burn, I took the hiking trail towards Cathedral Rock. It was a pleasant hike, with new views every time I turned a corner. There was the option for a steep hike to the top of Mount Charleston, which was 8 miles, would have taken awhile, and would not have been feasible for a guy wearing flip flops. I turned around about half a mile from Cathedral Rock, close enough to see it. That was plenty for the day. Even though the ride didn’t work out, I had a great time. I think that is the Charleston summit ahead, 12,000 feet. One of the gorgeous structures nearby. The hike would end just below this big rock. Rocky structures were alongside the road just a few miles in. 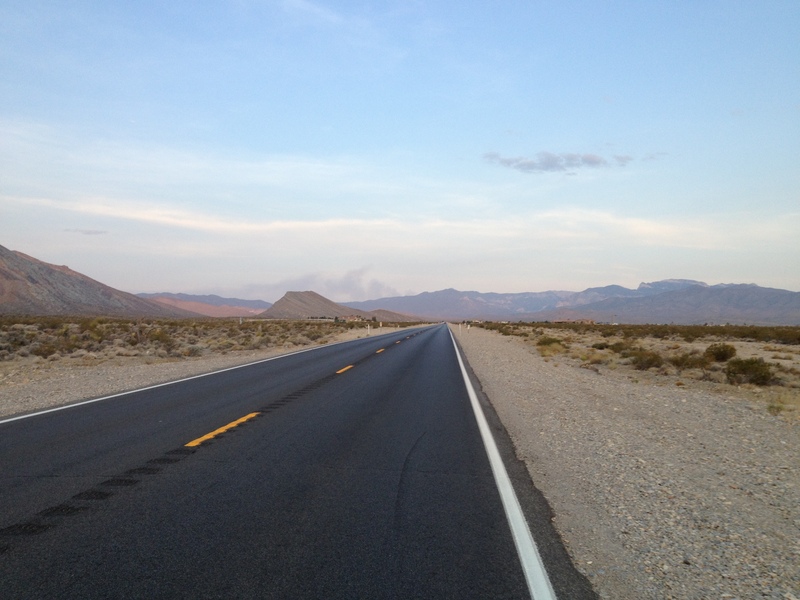 This entry was posted on Thursday, July 4th, 2013 at 11:13 am	and tagged with cathedral rock, cycling, flat tire, las vegas, mount charleston and posted in Climbs. You can follow any responses to this entry through the RSS 2.0 feed. Yikes! I guess it’s a good thing the flat occurred early on. To be stranded in the desert miles from help would have been very very bad. Congratulations on making a proverbial chicken sandwhich out of the stuff you were handed and thanks for the great pics. Yes, as frustrating as the flat tire was, at least it wasn’t 10 miles down the road, or worse, descending down the mountain. The chicken sandwich tasted good. Sorry to hear the ride didn’t work out as planned Aaron, but at least you made the most of a bad situation. Awesome pics, that is somewhere I would like to head with my camera someday! Hope your next ride is better! Thanks, Simone. If you ever head out here, I would recommend anytime but summer. That is one serious bummer brother.